Hi fellow acrylic explorers !! I'm a self taught artist that has tried many mediums over the years but have fallen in love with acrylics....especially the atelier interactives. I attended a workshop with Mark and Frankie earlier this year, and since then it has unleashed the painting beast inside of me !! I recently traveled through India and Nepal for a few months, and was immediately struck with intensity of everything from the smells, tastes, sounds and most of all COLOUR. I've been asked by so many people since then about our trip, but as I am not much of a wordsmith, or talker, I have decided to work on some pieces to create an exhibition early next year that brings a little bit of India and Nepal to Brisbane. Using my works as an expression of the emotions and feelings I had whilst there. Would like to know if you have any "Chapati" prints for sale? Am very interested if you do. How may I reach you? Email address? Thankyou so much for your kind words, I truly appreciate it. You not only captured stunning values of color you have captured the strength and majesty of this man. You have actually brought him to life! He is REAL. Keep painting - you definitely have a gift and please keep learning and sharing it with us! "Chapati" is an amazing painting Kurt!! The light reflections on the skin, the whole composition!! The colour!! I think it's fantastic. Your exhibition will be a resounding success, that's for sure. I love the character and the colours. I'm a "newby Artist" and as such my opinion may or may not be of much esteem, but i know what i like when i see it. Great job. 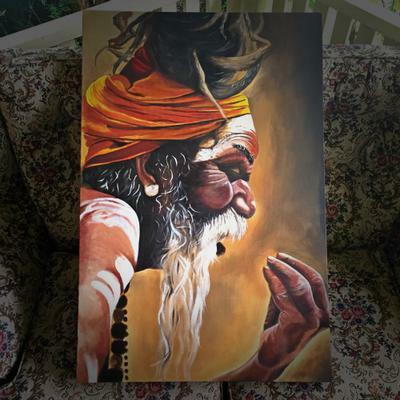 This painting is so captivating! I love the composition and use of color and light. Nice high contrast. I can't wait to see more!